There are many reasons why America should take the lead in action on climate change. It's fair that those who pollute most, do most to clean things up. America's current and historic emissions are huge, while a lot of what has been produced elsewhere is also consumed in America. Moreover, it's in everyone's interest if America takes the lead. That is confirmed by studies such as this one, showing that there are no technical or economic barriers against cleaning things up. Doing so has many benefits, including job and investment opportunities, and scope for exports. In order for American industries, such as car manufacture, to remain competitive with products from overseas, they must clean up their act. In addition, there are many health and the environmental benefits, while shifting to clean energy will remove perceived needs for America to send military forces across the world to protect global supply lines of fossil fuel. There are also legal obligations for America to act. Back in 2007, the Supreme Court ruled in Mass. 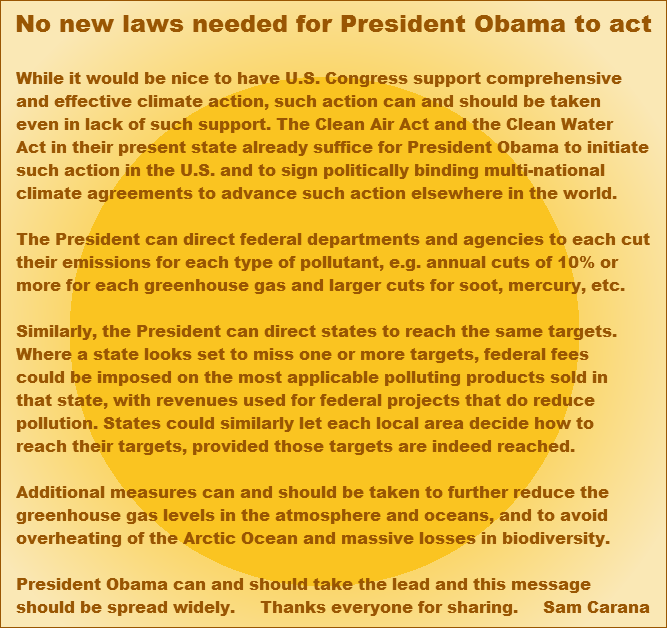 v. EPA that the EPA must act on any air pollutant that endangers public health or welfare. The EPA subsequently found this to be the case for six greenhouse gases and took action, including by issuing plans to limit carbon emissions from power plants. More recently, the United States Court of Appeals for the DC Circuit ruled in favor of the EPA plans. Furthermore, as Michael Burger points out, Section 115 of the Clean Air Act also authorizes the EPA to act on emissions that contribute to air pollution that endangers public health or welfare in other countries, the more so where the other countries provide the U.S. with reciprocal protections. At the Paris Agreement, such reciprocity was affirmed by some 190 nations (accounting for over 93% of current GHG emissions) pledging to hold the increase in the global average temperature to well below 2°C above pre-industrial levels and to pursue efforts to limit the temperature increase to 1.5°C above pre-industrial levels. In other words, no new laws are needed and action can and should be taken now, as this blog has pointed out for years, e.g. in this 2014 post that featured the image below. This blog has repeatedly pointed at another reason why especially America must act, and must do so rapidly, comprehensively and effectively. 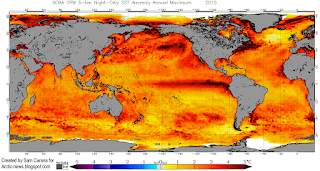 In October 2015, oceans reached record high temperatures, especially on the Northern Hemisphere, as illustrated by the image below. Northern Hemisphere October ocean temperatures based on NOAA 1880-2015 data - plot area goes from 1900 to 2050 and from -1 to 4 degrees Celsius above baseline, i.e. compared to the period 1901-2000, the 20th century average. Above image features a trendline showing that oceans on the Northern Hemisphere could, by the year 2043, be 4°C or 7.2°F warmer than the 20th century average. 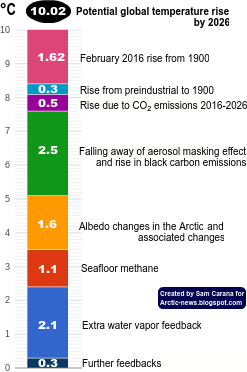 Increasingly, methane levels over the Arctic Ocean are showing strong increases from October onward, as huge amounts of ocean heat are reaching the seafloor of the Arctic Ocean from that month onward. 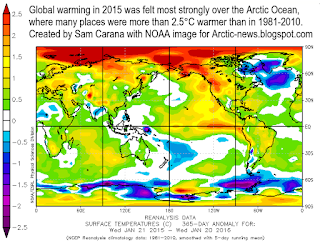 North America contributes strongly to accelerating warming of the Arctic Ocean. 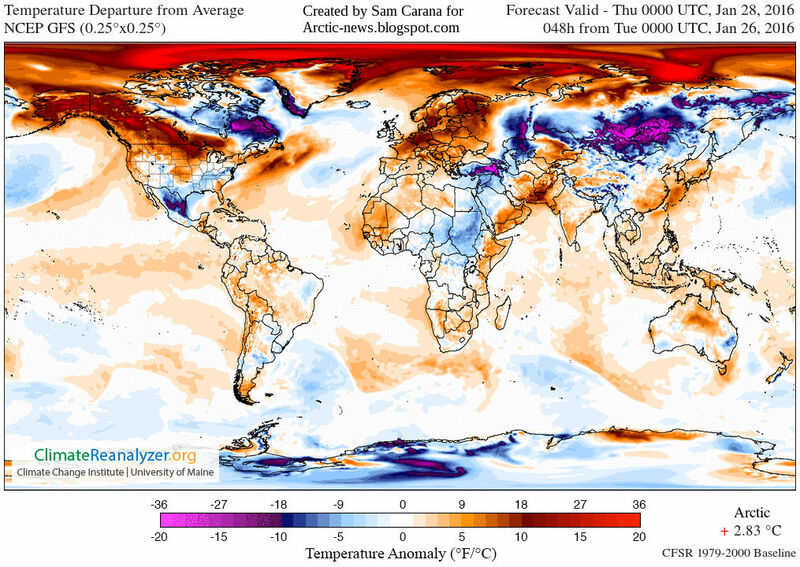 The Coriolis Effect makes that high levels of emissions originating from North America are extending over the Atlantic Ocean, and are warming up waters off the east coast of North America, as illustrated by the image below. 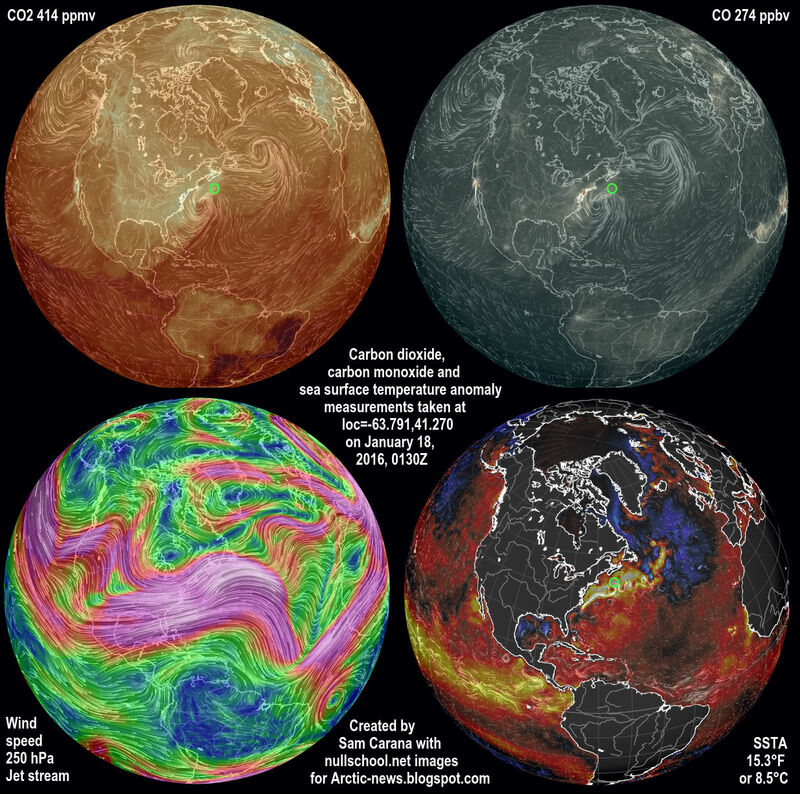 Top left: CO2 414 ppb green circle, up to 433 ppm in New Jersey. Top right: CO 274 ppb green circle, up to 890 ppb in New Jersey. Bottom left: Jet Stream 250 hPa. 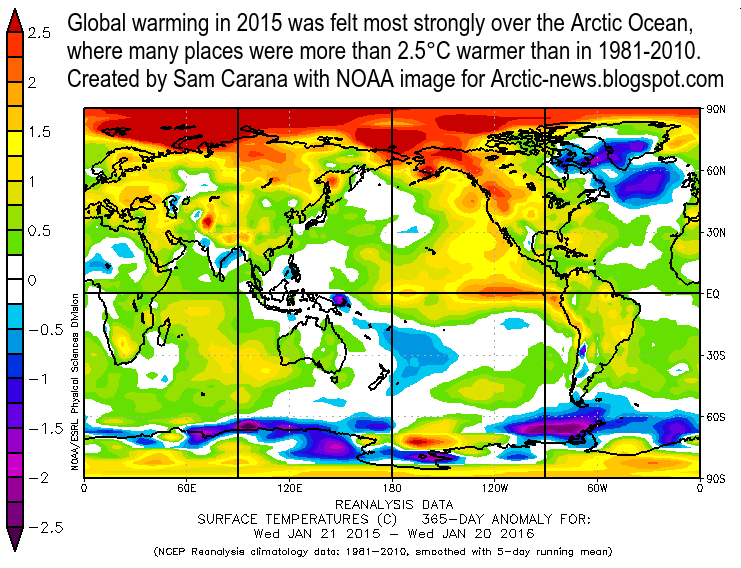 Bottom right: Sea surface temperature anomaly 8.5°C/15.3°F green circle. Carbon dioxide emissions are important, but also relevant are other emissions such as carbon monoxide that depletes hydroxyl, making it harder for methane to be oxidized. 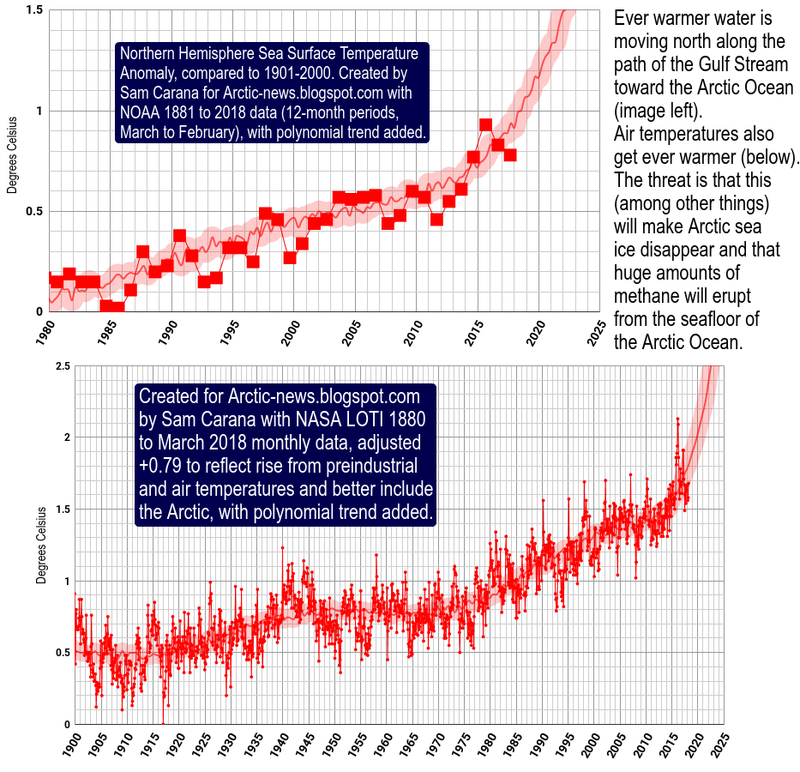 As emissions keep rising, the Gulf Stream will carry ever warmer water into the Arctic Ocean, resulting in greater melting of the sea ice and associated albedo changes that in turn accelerate warming in the Arctic. This is further illustrated by the images on the right. 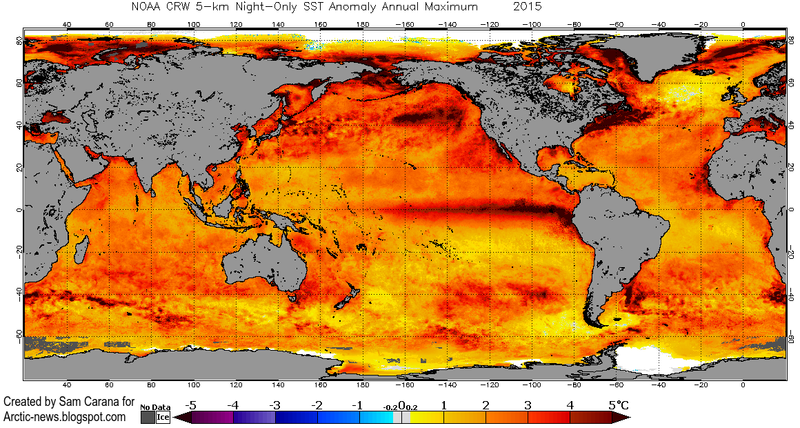 The top image shows 2015 maximum nightly sea surface temperature anomalies, with anomalies of 5°C off the North American east coast as well as in the Arctic Ocean. The second image on the right illustrate the extent at which warming in the Arctic Ocean is accelerating, compared to the rest of the world. 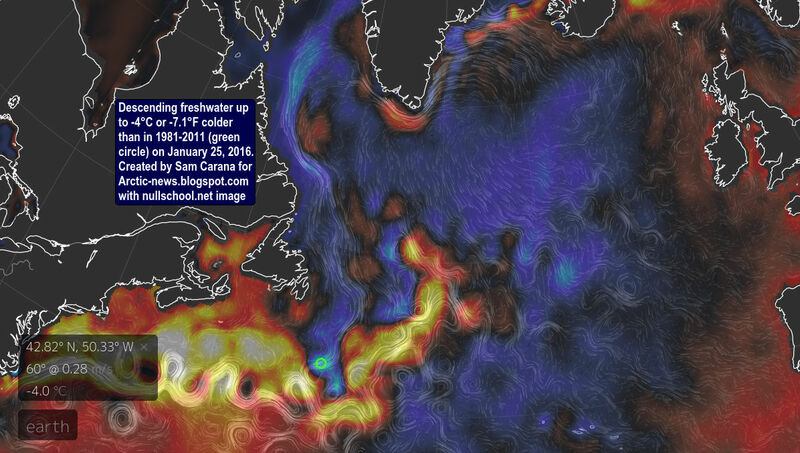 The image also shows the cold freshwater lid over the North Atlantic. As the temperature difference between the Arctic and the equator decreases, the jet stream gets more elongated, at times moving all across the Arctic Ocean. This is one of a multitude of feedbacks that contribute to accelerating warming of the Arctic Ocean. The result is illustrated by the third image on the right, showing strong warming over most of the Arctic Ocean, while at the same time some places on land at higher latitudes north are experiencing extremely cold conditions. 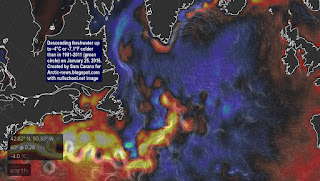 Another one of such feedbacks is that warmer water off the coast of North America will result in stronger winds moving over the North Atlantic toward the Arctic Ocean. This can also speed up ocean currents, so it can result in more heat being carried toward the Arctic Ocean both in the atmosphere and the water. Meltwater from glaciers and sea ice can descend along the edges of Greenland into the North Atlantic, forming a cold freshwater lid on the North Atlantic, where it accumulates at the surface over the years, as illustrated by the image on the right that points at a -4°C or -7.1°F anomaly compared to 1981-2011.
freshwater lid over the North Atlantic, as illustrated by the images on the right. While this cold freshwater may constitute a barrier that slows the flow of warm water toward the Arctic Ocean at the surface, the danger is that it prevents heat transfer to the atmosphere from warm water flowing below the sea surface, with the net result of more heat arriving in the Arctic Ocean. Furthermore, if this cold freshwater lid also prevents water from sinking deeper in the North Atlantic, this may also contribute to more warm water arriving in the Arctic ocean, as illustrated by the bottom image on the right. Such feedbacks can dramatically accelerate warming of Arctic Ocean, resulting in heat destabilizing sediments that can contain huge amounts of methane. In conclusion, America must take the lead in action on climate change. It's fair to do so, it will benefit everyone, there are legal obligations to do so and there is great urgency to act in the light of looming methane eruptions from the seafloor of the Arctic Ocean. According to Chris Hedges, it is not so much the average American that pollutes the most but the American corporations. They are the ones who do the most damage. So, it stands to reason that the American government and the American corporations should lead in this clean-up!